One of my favorite, all purpose, condiments on this little planet is sun dried tomatoes preserved in olive oil. 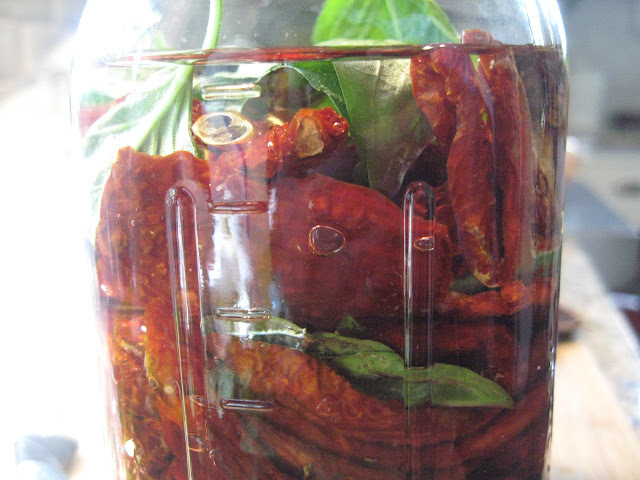 Authentic sun dried tomatoes capture the essence of the tomato and can be enjoyed year round. There is a difference between tomatoes that have been truly dried in the sun and dehydrated tomatoes (click here to learn how to dehydrate your own tomatoes). As a young boy, one of my first vivid memory includes large outdoor tables lined with hundreds of thinly sliced tomatoes laying in the Calabrian sun. My grandmother would dry the tomatoes outdoors for days until the slices turned a deep red color and shriveled beyond recognition. The sun was of the southern Italian variety, of course, and the tomatoes heirloom and nurtured, by most standards, better than most small children. The combination of dry/intense Mezzogiorno sun and superb tomatoes yielded a product that didn’t need much sprucing, but leave it to Nonna Vincenzina to preserve the tomatoes and add even more flavor. Start by finding a large, wide mouth, mason jar; pint size is fine, but if you can find larger jars they'll store more tomatoes. Wash your mason jar very well and you can even go as far as sterilizing the jar. Moreover, it's vital that your hands and any other tool used for the process are exceptionally clean. Repeat the above layering process until you're nearly at the top of the jar (don't over stuff the jar because your last step includes filling the jar with olive oil). When you're finished with each layer push down with a flat object to compress the ingredients. Finally, fill the jar with olive oil, making sure that the tomatoes are completely submerged (note: the oil will need some time to settle so make sure all of the tomatoes are covered). Screw on the lid tightly and store the jar in a cool, dark, closet or cupboard. You'll need to let the tomatoes sit 6-8 days before consuming them (the oil needs to soften the tomatoes and you also need to let the garlic, basil, and oregano do it's thing). Note and Disclaimer (viz a viz Clostridium Botulinum) It's vital when you cure vegetables in olive oil that you thoroughly clean the jar itself as well as all the ingredients and utensils used in the preparation. My family has been curing and pickling vegetables (as well as tomatoes for tomato sauce) for well over 50 years and we haven't had any health issues. Although our family has been doing this for many years without incident, there aren't good studies establishing this practice as safe. Many food safety authorities advise against preserving tomatoes and garlic in oil due the risk of bacterial contamination and proliferation of spores, especially clostridium botulinum, which could be fatal. 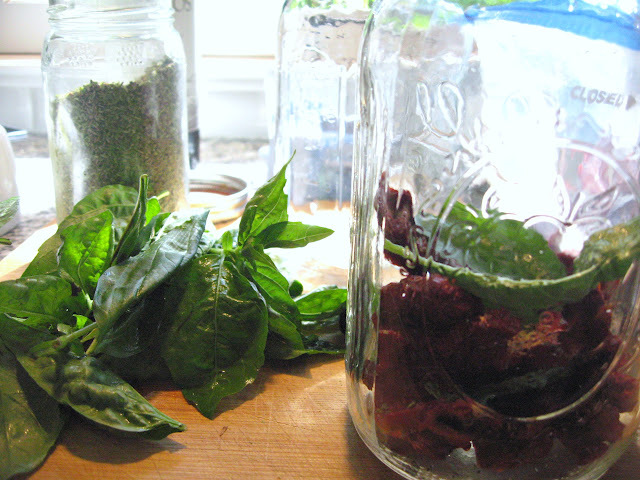 basil and sun dried tomato layers. 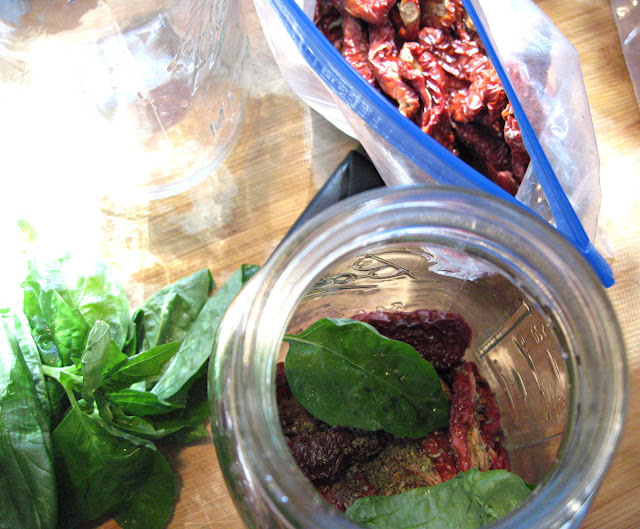 Wide mouth glass jars are excellent for sun dried tomatoes in olive oil because access is easy given the large opening. 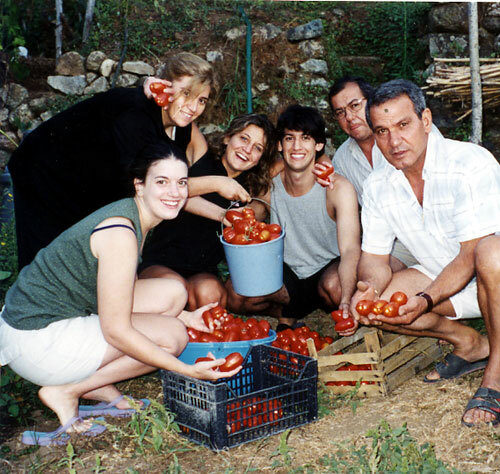 The family harvesting tomatoes in Calabria, Italy. It’s vital when you cure vegetables in olive oil that you thoroughly clean the jar itself as well as all the ingredients and utensils used in the preparation. My family has been curing and pickling vegetables (as well as tomatoes for tomato sauce) for well over 50 years and we haven’t had any health issues. Although our family has been doing this for many years without incident, there aren’t good studies establishing this practice as safe. Many food safety authorities advise against preserving tomatoes and garlic in oil due the risk of bacterial contamination and proliferation of spores, especially clostridium botulinum, which could be fatal. I’ve had these tomatoes. They are fantastic. Was that picture taken in Italy? Yes the pic was taken in Pellegrina (http://maps.google.com/maps?hl=en&rlz=1C1GGLS_enUS306US307&q=pellegrina+calabria&um=1&ie=UTF-8&split=0&gl=us&ei=Aix2SvqBE42KMrSN6bAM&sa=X&oi=geocode_result&ct=title&resnum=1 )! Do you seal the tomatoes in oil in a mason jar like you would do if you were canning? If not, how long does it last before it goes bad in a cupboard? I don’t use the same canning process as I would for canning tomatoes, for example. The oil should cure and preserve the tomatoes for 6-9 months (make small jars so you consume them quickly). 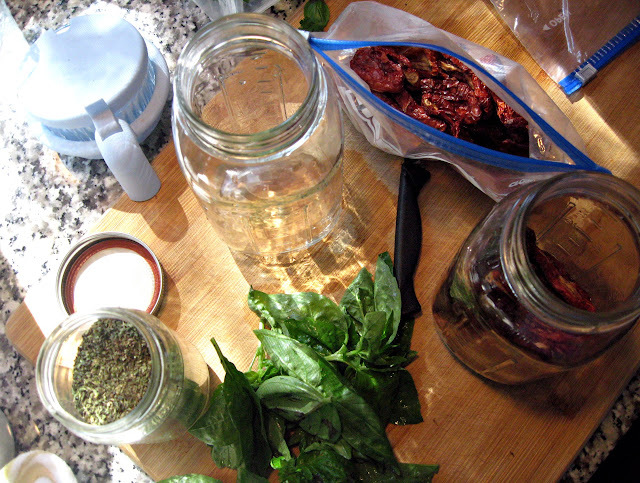 Also, store the jars in a dark and cool area and use a clean fork to dish out the tomatoes. Is it okay to refrigerate for storage before opening to ensure safety and longer shelf life? hi nancy, I wouldn’t put the sun dried tomatoes in the fridge, as you’ll kill the taste and texture. just be sure to store the jar in a cool and dark spot and you’ll be fine – Italian have been doing this for hundreds of years. Would you do this with oven roasted tomatoes, and instead of kosher salt, a celtic gray salt? I have a lot of garden tomatoes, not imported I’m afraid. Thanks! I don’t really like using oven roasted tomatoes. I find that the oven does something to the tomatoes and they don’t come out the same as tomatoes dried in the oven from Europe or CA. Also, the tomatoes (plum or roma) from Europe or CA tend to be of a better quality then most places here in the US. Regular kosher salt is fine; I don’t think using gray salt will improve flavor all that much. Thanks for the great recipe. It sounds fantastic! 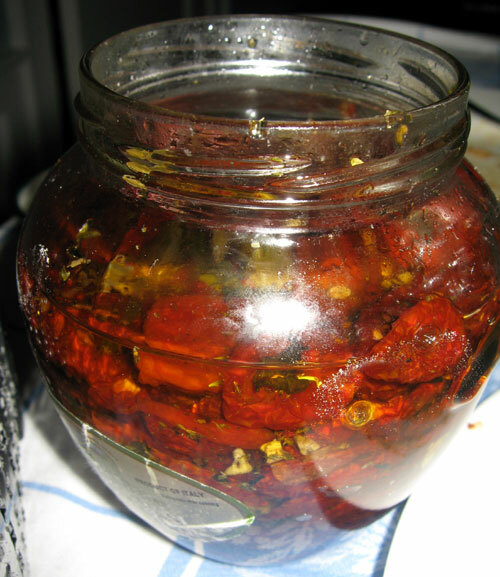 I’ve tried soaking sun dried tomatoes in olive oil in the past and they never did seem to soften. In fact, I still have some soaking in the cupboard that have been there for months. They’re probably way too old to eat at this point, but I was curious to see if they’d ever soften to the point where store-bought ‘sun dried tomatoes in olive oil’ are… and they aren’t even close. What’s your secret to get them to soften? Is it the salt? I didn’t add any salt. For the record, the tomatoes I started with were really dry. Do you start with tomatoes that still have some moisture in them? Did you layer the sun dried tomatoes, it’s important to season each layer (especially with kosher salt)? It’s important to buy the highest quality sun dried tomatoes, in fact if you can get them dried from Europe then they will be the highest quality. The tomatoes shouldn’t be really dry, they should contain a little bit of moisture. The softening happens over time, after about 2-3 weeks in the oil. who wants worlds best quality organic sun dried tomatoes? I read that the acidity content must be 3.5 or less to assure that there is not opportunity for botulism. That can be accomplished by using citric acid in between your layers or stir citric acid in with basil leaves & the fresh or roasted garlic before layering. There are some canning sites that tell how much citric acid to use for the weight or volume. Then if you do not like the acidic flavor add sugar to adjust the taste. Its a chemistry measurement. 7 is neutral. Anything less than 7 becomes more acidic. 3.5 is very acidic (seems to high actually). Regular house vinegar is about 4.5. The more alkaline something is its higher it is. oh, I was all set to get going tomorrow a.m. with my south Florida tomatoes, oregano and basil…BUT then, I saw the little “caveat” about botulism and now I am scared off. Any thoughts about this, anyone? I am a stupidhead…writing about my fear of botulism when the answer was right below my comment……. This is great, thank you. 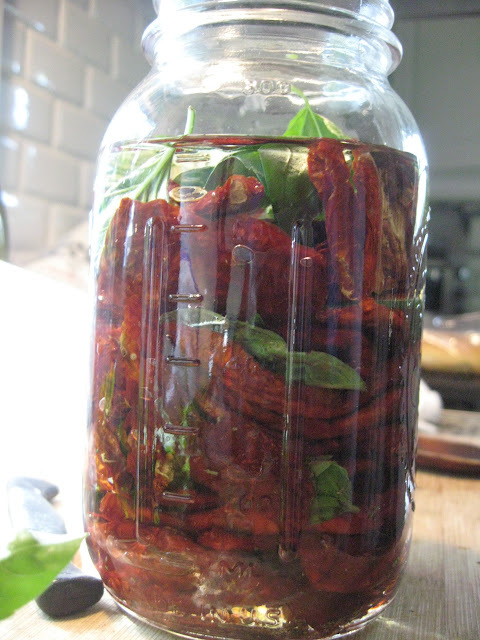 We’ve just returned from Tuscany with a bag full of sun dried tomatoes so will be using your recipe! Be careful using fresh anything unless you soak it in vinegar first. It’s just as easy and just as tasty to use dried basil and garlic when making these! Seriously, I’ve seen batches go bad, so it’s not a good thing. , and some sort of meat, thin sliced? do you mean an antipasto? Really good recipe which pruduces consistent results. Am now a regular with a batch most months. The only difficulty is that it is difficult to wait a week after preparation to taste!